When bowing before a sacred object such as a Buddha statue, one usually bows three times, recalling with the first bow the Buddha, then the Dharma and then the Sangha. One may simply offer a head-lowered bow with palms-together hands held in front of one's heart or forehead, or one may move one's hands in a single flowing movement from the head to the lips to the chest (representing thought, speech and body). More formally, one may bow with a series of head-to-floor prostrations. Symbolic offerings to the Three Jewels are often made prior to meditation. In front of the Buddha are placed the offerings, which may be just seven bowls of water symbolising the eight hospitalities offered to a guest. Another preferred style of offerings contains illumination, flowers, incense, fruit, music and water for washing and drinking. Each represents another aspect of Buddhist teachings and also the five senses. The flowers for example are a symbol of impermanence and saṃsāra (the cycle of birth, death and rebirth), due to their short life span; unless evergreen is used to show eternity. The candles symbolise enlightenment and the sense of sight while the incense is used to show that Buddhist teachings can be spread across the world just like the smell of the incense, which also purifies the air. As water is a necessity of life, a pure sample is also placed on the shrine to show respect and reverence for life. To show the interdependence of all things and gratitude for that fruit is offered—also as a symbol of taste. A bell is used to indicate when to begin and end puja and to stimulate hearing but also demonstrates the belief of cause and effect and karma. It stimulates hearing and is placed on a lotus-shaped cushion, once again symbolising enlightenment and the cycle of rebirth, as it flowers and seeds at the same time. Personal devotion usually entails first making an offering to a sacred object (such as placing flowers or fruits before a Buddha image). When making the offering, one bows while reciting traditional phrases identifying the offering. Next, the devotee either bows or prostrates three times to the Three Jewels. While continuing to kneel with palms-together hands held before the heart, the devotee then intones various chants typically starting with paying homage to Gautama Buddha, taking refuge in the Three Jewels and taking the Five Precepts. ↑ Rhys Davids & Stede (1921-25), p. 471, entry for "Pūjā," available at http://dsal.uchicago.edu/cgi-bin/philologic/getobject.pl?c.2:1:2985.pali (retrieved 2007-10-22). See also, for example, Khantipalo (1982). ↑ Harvey (1990), p. 172; ; Kariyawasam (1995), chapter 1, section 2, "Personal Worship"; as well as, for example, Lee & Thanissaro (1998). ↑ Harvey (1990), pp. 172-3; and, Indaratana (2002), pp. iv, v. Indaratana states that the basis for venerating stupas comes from the Mahaparinibbana Sutta. See, for example, Vajira & Story (1998), verses 25-31. ↑ See, for instance, Harvey (1990), p. 173; and, Kariyawasam, ch. 1, sect. 2, "Personal Worship." Harvey (1990) identifies the movement of the hands from head to lips to chest as being particular to Northern Buddhism but it has been seen in other Buddhist communities as well. Kariyawasam (1995) mentions that, in Sri Lanka, the less formal, standing type of bowing is popularly referred to as a sadhu. ↑ Khantipalo (1982), section entitled "Daily Practice"; and, Kariyawasam (1995), ch. 1, sect. 2, "Personal Worhsip." Note that Khantipalo (in writing about Thai practices) states that bowing should precede an offering while Kariyawasam (in writing about Sinhala practices) states that the bowing comes after the offering. ↑ Rhys Davids & Stede (1921-25), p. 77, entry for "Arahant" available at http://dsal.uchicago.edu/cgi-bin/philologic/getobject.pl?c.0:1:2081.pali (retrieved 2007-10-22). ↑ From the Sn 2.4 and Khp 5 (Soni & Khantipalo, 2006). Kariyawasam, A.G.S. (1995). Buddhist Ceremonies and Rituals of Sri Lanka (The Wheel Publication No. 402/404). Kandy, Sri Lanka: Buddhist Publication Society. Retrieved 2007-10-23 from "Access to Insight" (1996 transcription) at http://www.accesstoinsight.org/lib/authors/kariyawasam/wheel402.html. Khantipalo, Bhikkhu (1982). 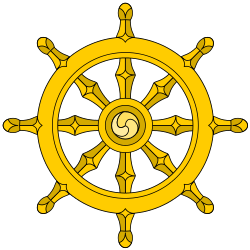 Lay Buddhist Practice: The Shrine Room, Uposatha Day, Rains Residence (The Wheel No. 206/207). Kandy, Sri Lanka: Buddhist Publication Society. Also transcribed (1995) and available on-line at: http://www.accesstoinsight.org/lib/authors/khantipalo/wheel206.html. Lee Dhammadharo, Ajaan & Thanissaro Bhikkhu (trans.) (1998). Visakha Puja. Available on-line at: http://www.accesstoinsight.org/lib/thai/lee/visakha.html. Soni, R.L. & Bhikkhu Khantipalo (2006). Life's Highest Blessings: The Maha Mangala Sutta. Available on-line at http://www.accesstoinsight.org/lib/authors/soni/wheel254.htm. Vajira, Sister & Francis Story (1998). Maha-parinibbana Sutta: Last Days of the Buddha (DN 16). Available on-line at http://www.accesstoinsight.org/canon/sutta/digha/dn16.html.